A couple of months ago I decided to plant a seed. Several seeds in fact. And these weren't metaphorical seeds either. They're the real deal baby. So into the ground (planters actually... I've had to move too many times to actually put things in a piece of land I might not be around in a few months) went tomatoes, basil, mint, parsley, coriander, some stuff I found outside my house that looked like seeds, thyme and some raspberry bushes. 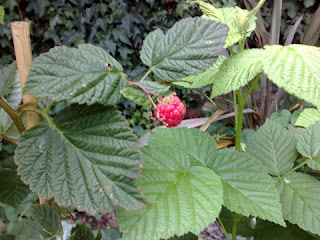 Aaanyway - havng harvested my crop of raspberries I had to work out what to do with them. I like cooking. I'm pretty good at it if I do say so myself. Somewhere along the path I learnt how to make the perfect creme brulee... Many have been made, but none with a crop from my own seed... ha ha ha... sorry I'm more than a little drunk. So - creme brulee then. Here's my recipe. Got it from a chef in my home town that had made the best one I'd ever tasted. I bought him the worlds biggest mojito and got him pissed. Eventually he gave it up. Preheat oven to 150 celcius. Whisk together the egg yolks and sugar until the sugar has dissolved and the mixture is thick and pale yellow. Pale yellow like a jaundiced sailor. Add the cream and vanilla seeds, continue to whisk until it's well blended. Strain it into a bowl, skimming off any foam or bubbles. This is important... air will kill it like a ninja kills the advertising execs in charge of the coca cola account. When you're ready to serve, sprinkle a handfull of raspberries over the brulee and push them in just a little... don't be too heavy like Heavy D. Then cover those bad boy berries with about 2 teaspoons of castor sugar (or however much you like, I like a thick crusty crunch so I go all Michael J Fox on the sugar...) Now go freakin nuts with the blow torch. I swear, the burning makes the combo of the castor sugar and the natural sugars in the berries make a caramel that will make a midget taller. Is it any wonder I'm directing a food show in a few weeks, which is also going to be on Channel 7 for our Australian audience too I just found out today! Yay, as I skip around my lounge. I really need to stop skipping. my mouth was full of wanton drool by the end of that. i even have the bloody vanilla! and i'm gonna make 'em THIS week. i'll maybe even post the pictures! i like the image of you in your frilly apron, gadding about your kitchen. your neighbours probably like it too. congrats on your imminent meteoric rise to fame via a food program on channel bloody 7!!!!! please let us all know when to have our little faces glued to the screen? congrats on the food show! tell us when its on and I'll make sure I'll take time off for tea and cupcakes. I didnt think boys could skip. Why cant you show photos? PS. I dont have a blow torch. Will a cigarette lighter do?